Of course you can buy Tortellini frozen, fresh or even dried. These are pillows of perfection you will never go back to the store bought when you make your own! Boil pasta to package instructions. Drain. Add the fresh marinara sauce. Top with mozzarella and generous amounts of grated cheese. Bake for around 20 minutes until cheese melts then turn the broiler on for a few minutes until cheese starts to brown. Place the flour in a large bowl, put the eggs in the middle and add the salt, water and oil. Mix and then knead into a smooth ball, add more water if needed. Rest for 30 minutes covered. Roll dough out and cut into 2 inch circles. Add a 1/2 to less than a teaspoon of filling recipe below. Fold over like a half moon shape then join edges to make a circle. Boil pasta in salted water. Drain and add the sauce to top. Follow directions above for Baked Tortellini. Oooh, boy. 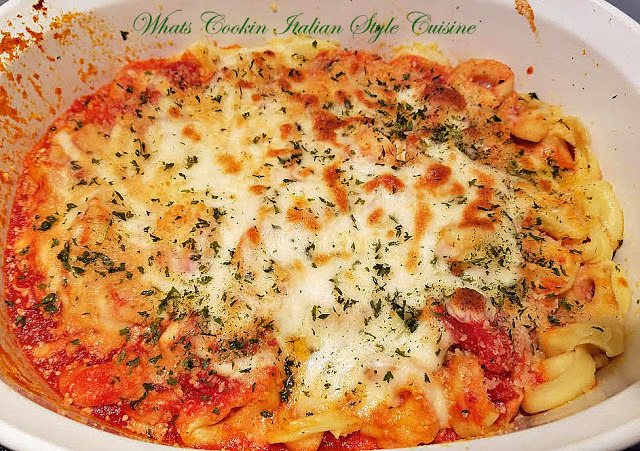 I bet this is amazing with your homemade tortellini!! !